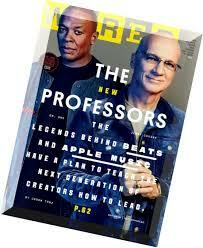 Jimmy Iovine’s career goes back to engineering albums by John Lennon, producing records by Stevie Nicks and U2, co-founding Interscope Records (Tupac Shakur, Snoop Dogg, Dr. Dre), introducing the world to Eminem and taking a pivotal role in the career of Nine Inch Nails’ frontman/soundtrack composer Trent Reznor. Currently he is head of Apple Music’s streaming service. He is quoted in the article “Relentless” by Jason Tanz in Sept. 2015 issue.